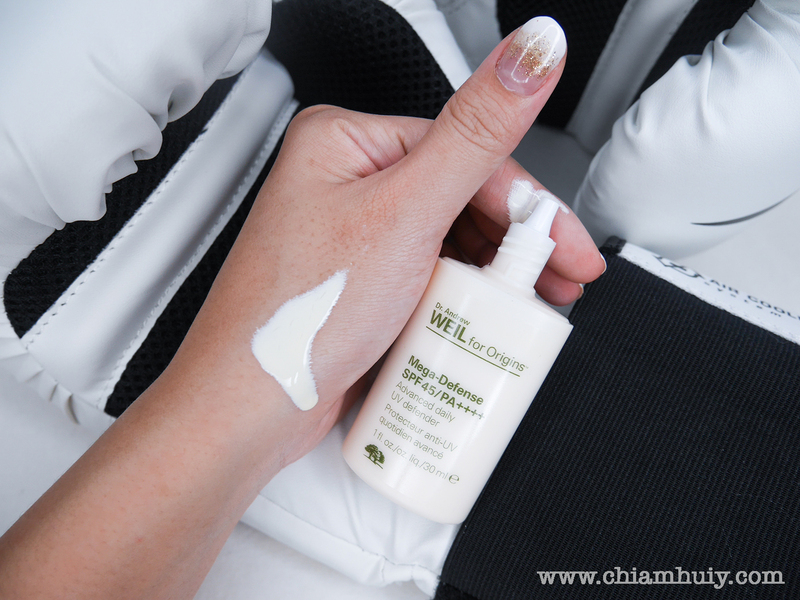 When it comes to sun-protection, the most basic product to use is definitely the sunscreen. 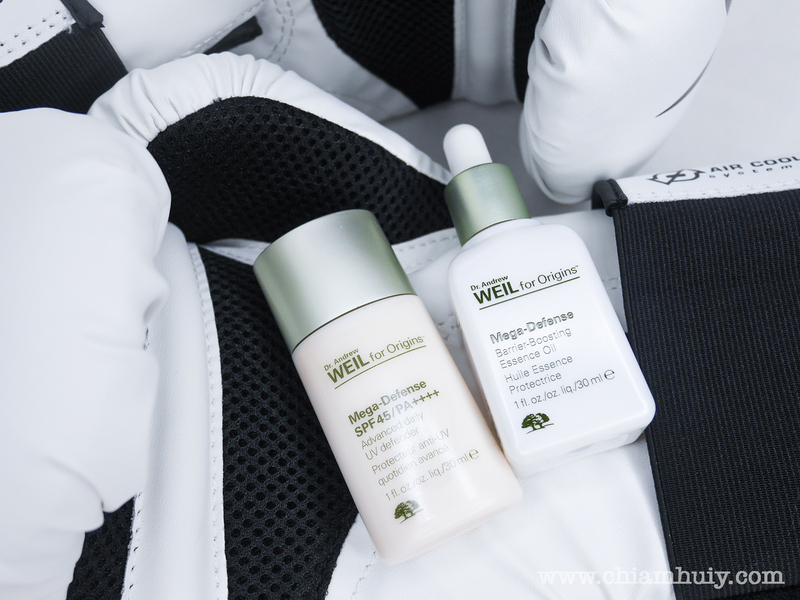 But nowadays there are more and more products formulated with sun protection efficacies, such as the Origins NEW Mega-Defense skincare collection! 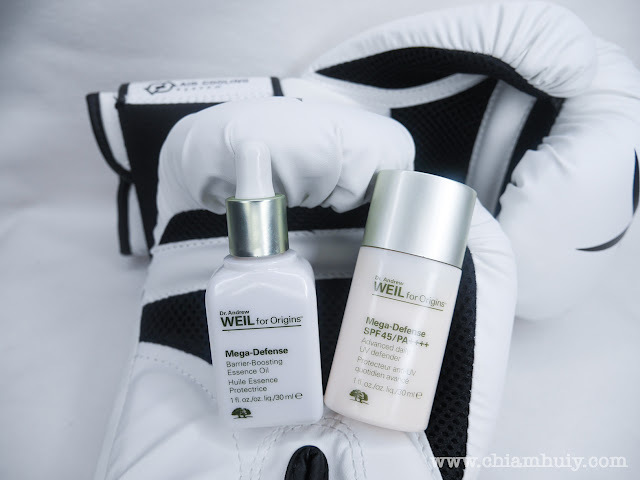 With the philosophy of PROTECT, DEFEND AND STRENGTHEN, Origins Mega-Defense skincare collection will bring you sun protection efforts up to another level. Today I'm gonna review two items in this collection: Origins Mega-Defense SPF 45 Advanced UV Defender and Barrier-Boosting Essence Oil. According to the philosophy of this collection, the Mega-Defense collection employs a three-tier system to protect skin from pollution, defend from harmful UVA/UVB rays and strengthen skin’s barrier to protect from future assault. I can say this is my new favourite sun screen! After my usual skincare routine in the day, I will put this onto my skin and it sets in nicely. I won't say it gives a matte finishing, but the greasiness is just nice. It's not too greasy per say but it doesn't dry the hell out of my skin. It's non-tinted in case you wanna know! As you can see (below picture) that it blends off so well, leaves no residue no streaks. I like that it leaves a clean weightless finishing. 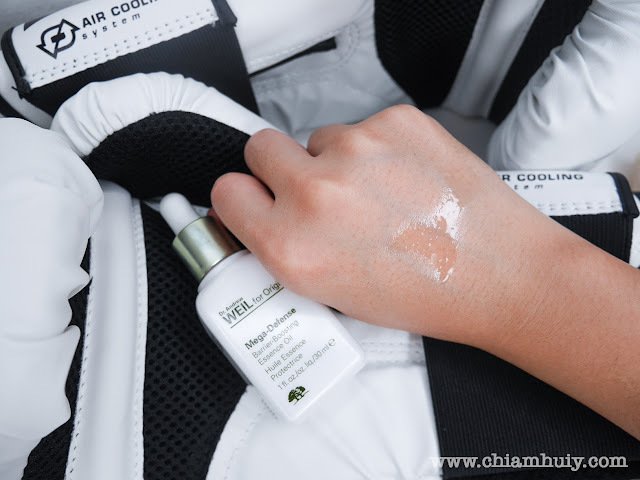 This UV Sunscreen also comes with SPF 45, which I think is suitable and adequate enough for my skin. I usually prefer something above 30 or so because the higher it is, it means the longer it can protect my skin. 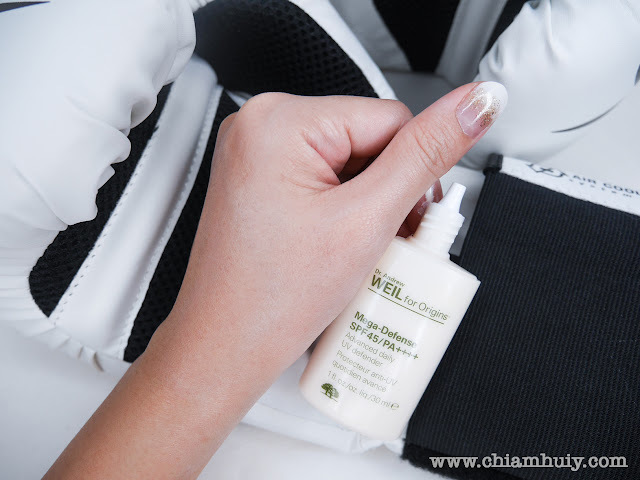 With the intention to defend our skin against environmental hazards, this essence oil will create a barrier to protect our skin. As you see, it's an essence oil which may leave a slight oily finish. I find this so moisturising, I think one or two drops is good enough to cover the whole face, feeling refreshed and moisturised! 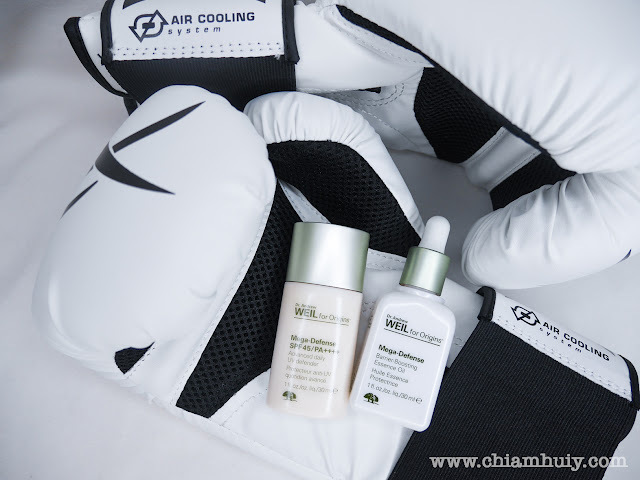 This essence oil also helps nourishes and strengthens skin’s barrier by building resilience. The direction says to use this after your usual serum before using this essence. Ooh I thought essence oil usually comes before serum, looks like I'm mistaken! Did I mention both product actually smell very good? They have a citrusy scent so you wouldn't have to worry about having to stand unbearable stench. 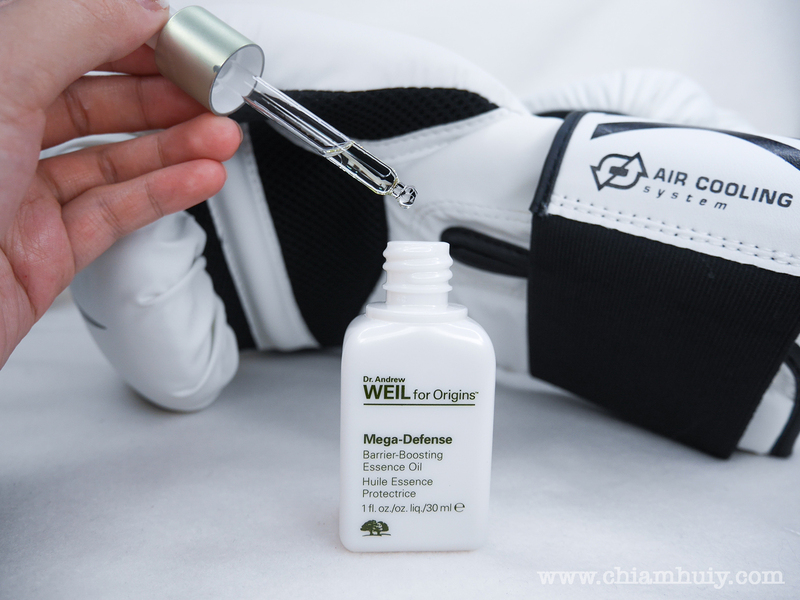 Enjoy this Dr. Andrew Weil for Origins™ Mega-Defense collection to provide a multi-dimensional treatment to protect skin from pollution! This collection will be available at Origins from March 2016.